Gary Gillman, Toronto (via email): Why does Anchor continue to use pasteurization even for draft beer? Most craft beer I am familiar with is not pasteurized except for some bottled and canned product. Isn’t unpasteurized beer superior in flavor? Bob: Good question Gary, and one that comes up from time to time. The short answer is that pasteurization ensures the freshness of the beer and greatly enhances its shelf life as well. The notion that flavor is somehow adversely affected by the process is matter of opinion – and of some debate. There are different methods of pasteurization employed by breweries. 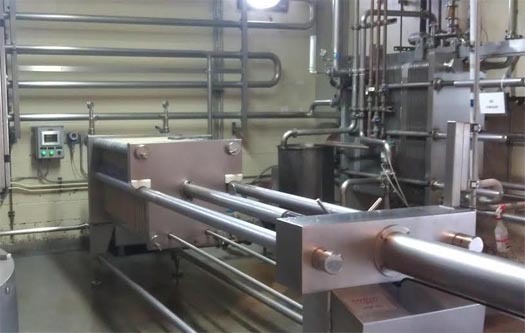 There is “tunnel” pasteurization, whereby the filled can or bottle is sprayed with hot and then cold water as it moves along a conveyor under a shroud. This gradually brings the temperature of the package up to pasteurization levels and then cools it down. The process can take 30 minutes or more. It is not possible to do this with kegs, however, because of the volume of liquid would take much, much longer to heat and cool. This is why packaged beer was pasteurized and kegs were not. Here at Anchor Brewing we employ a different technique called “flash” pasteurization. The beer is heated in a pipe as it flows from the filter to the bright tank using a thermal bypass system. This is essentially a pipe within a pipe with heated water or steam flowing one way and the beer flowing the other. The beer is brought up to temperature and then immediately run through a heat exchanger and cooled back down. This process takes 20 seconds instead of 30 minutes. 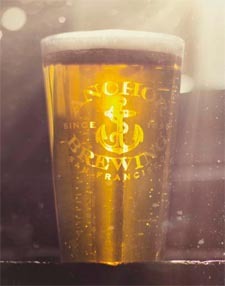 Since all of our beer is treated like this, kegs of Anchor beer contain pasteurized beer, just like our bottles. The flavor issue has two sides and there’s a lot of misinformation being circulated as fact. One side insists that heat pasteurization robs the beer of flavor and otherwise negatively affects its quality, while the other side holds that it has no discernible effect on the flavor profile. We believe the latter to be true. I have yet to encounter anyone, other than ourselves, of course, who has compared our products to a blind “before and after” taste test. A beer critic once published some bold statements concerning his perceptions that one of our finest products had a “dead, flat, and cardboard-like flavor” compared to an unpasteurized example of another brewery’s beer. Interestingly enough the late Michael Jackson, the world renowned beer expert, had given this same beer his highest rating. Our critic declined several invitations to come and do a blind comparison at the brewery. No big surprise. The basic purpose of pasteurization is to ensure that there are no microorganisms in the packaged beer that could cause it to spoil over time. In modern times, strict adherence to high levels of industrial sanitation in brewing has virtually eliminated the possibility bacterial contamination, but pasteurization continues as an extra level of quality control. There are a few exceptions to this in the larger end of the brewing industry, whereby extremely tight filtration is employed rather than heat as a technique to achieve the same end. However, one brewery which does this requires that their beer be held under refrigeration at all times. Another touts the superiority of their “cold filtration” process irrespective of the fact that all beer is filtered cold. As far as the craft breweries that do not pasteurize go, many of them are small and cannot afford the necessary equipment. Others are brewing interesting styles such as sour beer, Lambic, barrel-aged, or aggressively-hopped ales and choose not to as a part of the profile. Some of these also have relatively local distribution, so shelf life is not an issue. Brewpubs often use the “unpasteurized is better” line as a marketing tool, but then their beer usually isn’t packaged or shipped either. It is safe to assume that any brewery that becomes large enough to ship out-of-state will likely pasteurize their products regardless of any previous position that they may have taken on the subject. It is also safe to assume that as long as we have a vibrant and innovative craft brewing industry, the debate will continue.